Who's got game? Antler's got game. Literally. 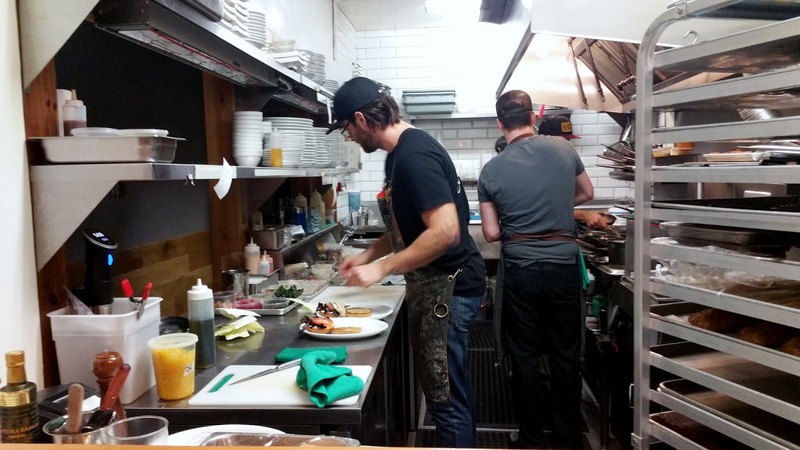 I had dinner at Antler Kitchen & Bar with a couple of friends just before the new year. I had a feeling our meal would be good but not this good; I didn't expect it to knock my socks off or anything but it totally did! Antler is now one of my favourite restaurants in the city. With the aim to showcase local Canadian cuisine, Antler (Twitter: @antlerkitchen, Facebook: Antler) focuses on sourcing regional ingredients, Canadian sourced farmed-raised game and foraged foods. 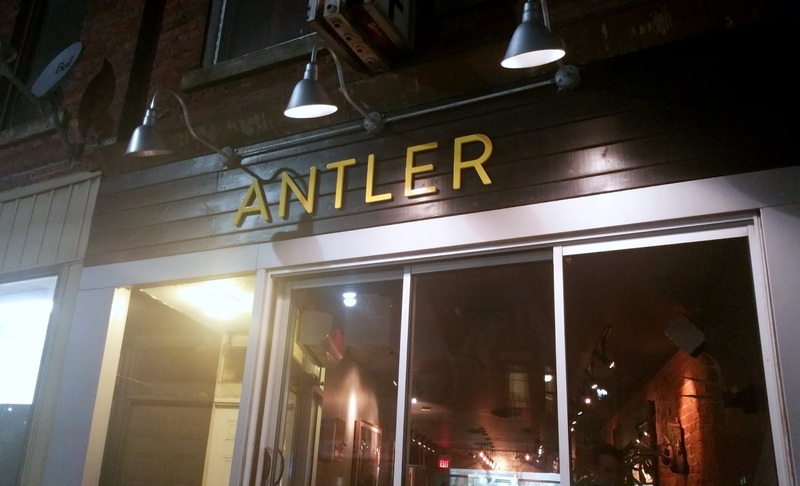 Chef Michael Hunter, formerly of Scarpetta and Reds Wine Tavern, broke away from the corporate kitchen earlier this year and alongside Jody Shapiro, a filmmaker/photographer friend of Hunter's, the duo opened Antler in October. 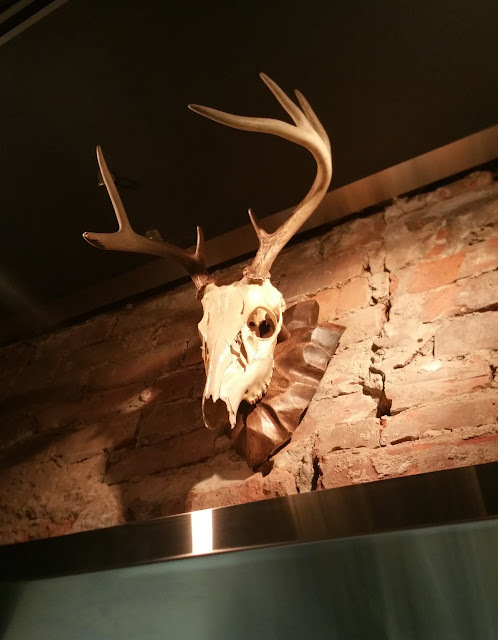 My friends and I sat at the chef's rail where the great outdoors, specifically deer skull from the first buck Hunter shot, was right above us. The chef's table at Antler fits three people perfectly; it was a bit of a tight squeeze for the four of us but we managed. Raised on a horse farm in Caledon, Hunter (@thehunterchef) has been passionate about foraging and hunting wild game ever since he was a little kid. 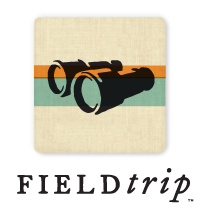 "I’m inspired by the seasons and what I find when foraging and hunting. Food simply tastes better when it is freshly harvested because it’s growing in its natural habitat. I am and always have been a strong, vocal advocate for wild game, conservation and hunting. Animals should be free to roam and free from cramped pens. This means they are healthier for us because wild game is therefore free from growth hormones and unnecessary antibiotics." Hunter describing his style of cooking in an interview with Butter PR. 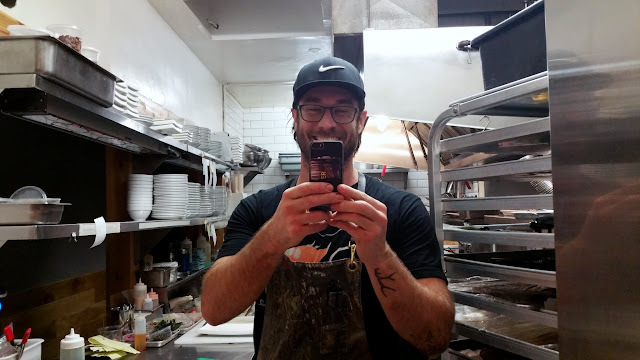 Chef Hunter caught me taking a picture of him. What does he do? He takes his phone out and starts taking pictures of me taking pictures of him. Ha! Antler's menu is divided into Snacks, Starters, Handmade Pastas, Entrees and Desserts. The restaurant's forest-to-table concept goes beyond their food menu; their cocktails also feature natural ingredients that Hunter foraged from the countryside. Antler infuses tree bark and berries into natural infusions, syrups and dusts, crafting unique and flavourful cocktails. We asked chef Hunter to just feed us, and our only request for him was to "skip the salads". What I love most about Antler, aside from the marvelous dinner I had, is their incredibly approachable menu. It is a menu that I think anybody and everybody can relate to and appreciate. There is nothing pretentious or abstract about Hunter's Jamaican patty stuffed with venison, pan-fried gyozas with wild boar, or his burger made from wild boar, bison and deer. These dishes are all essentially familiar dishes but elevated with a wild twist, or simply "game versions" of classics. This is why I think Antler is an ideal place for people who have tried and love game, as well as those trying game for the first time. It is difficult to say what the highlights are because everything was incredibly tasty. Thinking back, I did like some plates more than others but I can confidently say that every plate was either "good" or "fantastic" with nothing being "bad" or "meh". But if were to visit Antler again, say tonight, I would want to order these dishes again: the Waterfowl Terrine (which is sadly not on the regular menu), Wild Mushroom Tarte Tatin, Ricotta Cavatelli, Game Burger, Spice Ash Crusted Rack of Deer, and Warm Chocolate Brownie. Actually, I do have one "complaint" if I can even call it that. I thought the venison in the Jamaican patty needed more seasoning as it was lacking a bit in flavour. The spicy sauce helped a bit but it was extremely spicy so it is definitely not for everybody. I'd rather eat a more flavourful patty without having to use a sauce.